MVpico series line lasers are just 50 mm long and have a diameter of 10 mm. Thus, they are well suited for integration in intelligent 3D vision sensors. Despite their small housing, they achieve output power levels of up to 100 mW. MVpico lasers are also equipped with the new 2017-edition focusing mechanism for quicker and more accurate adjustment of the focal distance. A variety of optics guarantees the best ratio between line thickness and depth of focus for each application. MVpico modules are available in different versions: with an adjustable focus, with a fixed focal point that is set during factory production, with separate optical and electronic elements, and without control electronics. All FLEXPOINT® lasers are manufactured at plants that belong to the LASER COMPONENTS Group. Thus, we have the unique ability to flexibly respond to customers’ requests. 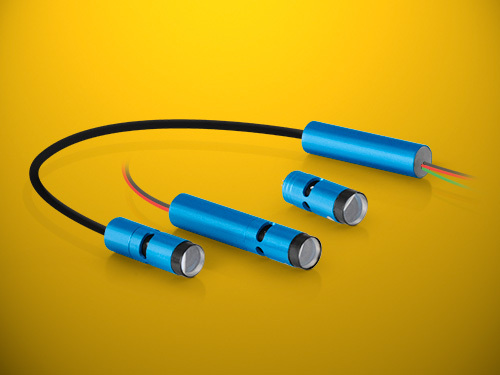 Simply let us know what your needs are and we will find a solution for your special laser module together!